In our how to start a WordPress blog 2018 tutorial, we’ll cover the fundamentals of WordPress and show you how to get started. There are a few things to consider prior to starting your blog, such as defining your objectives, identifying your target audience or niche, and the attributes you’ll need to incorporate to ensure your blog is a success. If you haven’t got clarity on this yet, you may want to read our beginner’s guide to starting a blog, as this article will focus more on the practical steps of setting up a WordPress blog, rather than the reason for why you would want to start a blog. There are two types of WordPress blogs, a self-hosted option (WordPress.org), or a WordPress hosted option (WordPress.com) which has limited functionality and design options as it restricts access to themes and plugins. For this reason, most bloggers will choose a self-hosted option, and for the purpose of this article we’ll go through the steps involved in setting up a self-hosted WordPress blog, using bluehost. Once you’ve given consideration to what you want to blog about and how you’ll measure success, you’ll need to select a domain name and start to put together content for your blog. Your domain name should be something relevant and memorable. It’s a good idea to keep it short, unique, and brandable. You will need to set aside a small budget (about $100 – 150) to secure your domain name, hosting, and a WordPress theme to customize your blog to your specific design style. We will go through these steps in the next five sections. Choosing your domain name is an incredibly important step in the process. I would recommend watching the video by Rand Fishkin of Moz on how to help select the right domain name for your blog. We will set up our blog domain and hosting using Bluehost (access discount hosting and free domain with this link). 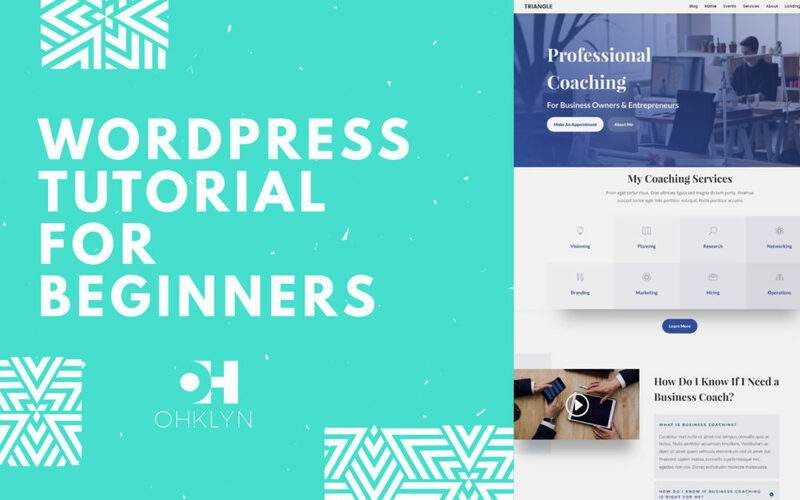 As part of the OHKLYN community you will get access to discounted hosting, and a free domain. The free Bluehost domain extensions included are (.com, .online, .site, .website, .space, .tech, .store, .net, .org, .info, .co, .us, .biz, .club). To get started, follow this link to the Bluehost website, and click ‘Get Started Now’. Select the plan that’s right for you and then choose your free domain name by entering it into the ‘new domain’ field. If you’ve already purchased your domain name, enter your domain in the ‘transfer domain’ field (remember to review the article on how to change the DNS records to point at Bluehost). You can then set your password for you hosting account. Congratulations! Once you’ve done that you’ll officially have a blog! In the next few steps, we’ll go through how to customize your blog design and how to add content. Menus – Menus are the primary vehicle for users to navigate through your WordPress blog. By default every theme will have a primary navigation menu, however, many themes will provide you with the option to have multiple menus, as well as mega-menus which are very popular in fashion, beauty, and lifestyle blogs. To upload media, go to ‘Media’ > ‘Add new’ and either select the files from your computer or simply drag and drop them into the library. Try to keep image files as small as possible (typically no larger than 500kb) as larger files will slow down your blog’s page load speed. General: Here is where you set your site name and tag line, assign an admin email account for your blog, and set the language and timezone for your blog amongst other things. Reading: From here you are able to set the homepage for your blog, adjust how many posts are displayed on index pages, and most importantly toggle on and of the visibility of your blog to search engines. Theme settings / customizer – Although the theme customizer settings will be different for every WordPress theme, how you go about customizing your blog will be similar. Once you’ve got WordPress installed and you’ve familiarized yourself with the WordPress dashboard and its primary features, it’s time to select and upload your WordPress theme. What is a WordPress theme? A WordPress theme is a collection of files that integrate with the core functionality of WordPress, enabling you to customize the look and feel of your WordPress blog to suit your design style. The great thing about Olsen is that is compatible with the Divi page builder. If you’ve watched any of our WordPress tutorials with Divi, then you’ll know how easy it is to create beautiful layouts with the Divi builder. Keep the file zipped and navigate to ‘Appearance’ > ‘Themes’. Select ‘Add new’, then click on ‘Upload theme’. Choose the theme.zip file and select ‘open’, then ‘Install now’. Once your theme has uploaded successfully, select ‘Activate’ and you’re all set. The value in choosing a premium WordPress theme over a free WordPress theme is that you will get access to theme documentation which will walk you through the specifics of how to customize your WordPress blog. This will either be in the form of text and images, or videos. The other benefit to choosing a premium theme from one of the providers listed above is that you’ll get access to 24/7 support which is great, particularly if you’re relatively new to WordPress. So, go through the theme documentation and reach out to support if anything is unclear. By now you’ll be ready to upload content to your WordPress website. We’ve covered off how to create pages, posts, and menus as well as how to upload images and assets to your blog. If you want to include quality stock images in your blog, check out some free image resources like unsplash, pexels, canva, or if you want more specific images, you can try shutterstock or depositphotos. We’ve covered off a lot so far and hopefully you’re in the process of setting up your new blog. 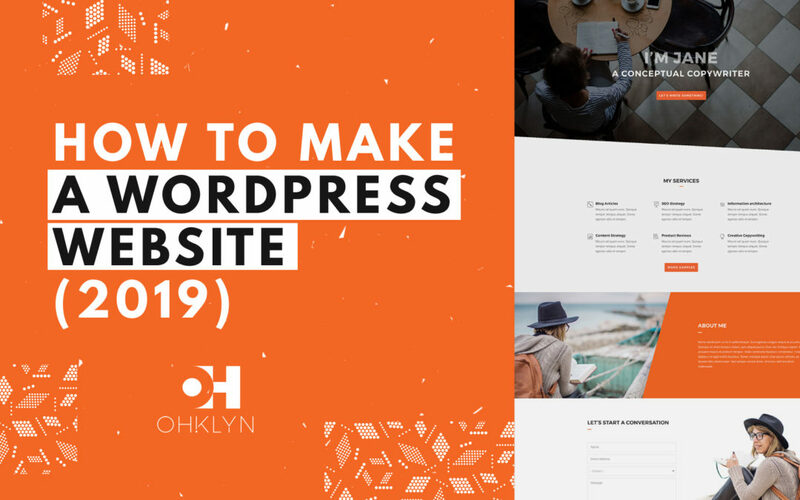 If you want to learn more about the process of building a website or blog with WordPress, feel free to explore one of our free WordPress tutorials and sign up to the OHKLYN newsletter to stay up to date with the latest how-to guides and free tutorials. Happy blogging!